Roseola is a common viral infection that usually affects babies and toddlers. It typically causes a fever and a spotty rash for a few days. While the rash may look alarming, roseola tends to be mild and you can normally look after your child at home. They'll usually recover within a week. Roseola can also affect older children and adults, but this is uncommon because most children will have been infected by the time they start nursery and it's rare to get it more than once. 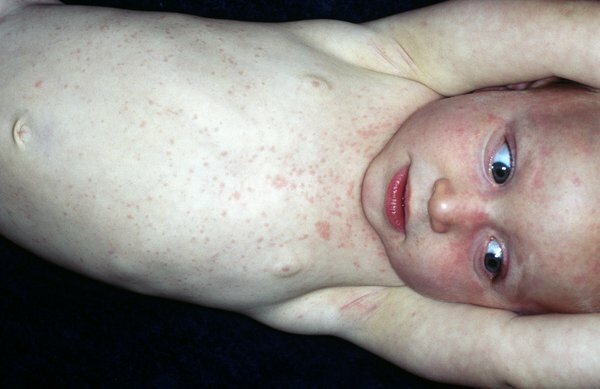 Roseola is also sometimes called "roseola infantum" or "sixth disease". Roseola doesn't always cause noticeable symptoms. If they do develop, they'll usually start a week or two after becoming infected. These symptoms typically last three to five days, at which point a rash often appears. Some children also have fits (seizures) known as febrile seizures. These can be frightening, but are usually harmless. The roseola rash usually appears once the fever has gone down. It can be difficult to tell the rash apart from similar childhood infections, such as measles, rubella or scarlet fever. You can usually look after your child at home until they're feeling better. Don't give your child paracetamol and ibuprofen at the same time. If one doesn't work, you may want to try the other one later. Never give aspirin to children under 16 unless advised to by a doctor. Read more advice about treating a high temperature in children. Most children recover within a week, so there's usually no need to see a GP. Also speak to your GP if you have a weakened immune system – for example, because you're having chemotherapy – and you've had contact with a child with roseola. Roseola doesn't usually cause any serious problems, but it's important to look out for these symptoms and get help if they occur. Roseola is spread in a similar way to the common cold – through coughs and sneezes, and contaminated objects or surfaces. It doesn't spread very easily and you don't need to keep your child away from nursery or school if they're feeling well enough to attend. If they're unwell, keep them at home until they feel better, although there's no need to wait until the last spot disappears. It's unclear exactly how long a child with roseola is contagious. They may be able to pass on the infection the whole time they're ill, including before the rash develops.